King Abdullah - the sovereign ruler of 77% of former Palestine (now called Jordan) - and Mahmoud Abbas - the touted President of another proposed Arab State in 6% of former Palestine (now called the West Bank and Gaza) - were both in Washington this week for talks with President Bush. Their talks centred on the urgency of implementing Mr Bush’s Road Map calling for the creation of Abbas’s new State prior to the President’s departure from office in January 2009. Their visit was in reality a complete waste of time. The Road Map - conceived in 2002 - has already passed its 2005 “use by date” unimplemented in even the smallest detail. Events since then - especially Israel’s unilateral evacuation from Gaza, the war in Lebanon and the rise of Hamas to supreme power in Gaza - have rendered the Road Map totally obsolete and of no real consequence. Yet the major players continue to cling to this lifeline as it rapidly frays into total disintegration. Abdullah and Abbas held separate meetings - rather than a joint meeting - with President Bush. The reasons for this are unexplained. It certainly indicates the growing divergence of any common interests between Abdullah and Abbas as a result of the intransigent stance of Abbas on the Road map negotiations. 1. Renouncing the demand that millions of Arabs be allowed to emigrate to Israel. 2. Abandoning the claim that every square meter of the West Bank and Gaza be ceded by Israel in favour of the proposed Arab State. 1. The Arabs must renounce their emigration demand. 2. The Arabs cannot realistically expect that Israel will cede all of the West Bank and Gaza to them. Without any movement on these two issues by the Arabs, President Bush can say goodbye to his Road Map leading anywhere but to ignominy and humiliation. Significantly neither Abdullah nor Abbas was able to advance any proposal to end the power struggle between the Palestine Liberation Organisation (PLO) and Hamas that has wreaked havoc on Abbas’ hold on Gaza, threatens to undermine his authority in the West Bank and stymied President Bush’s objectives under the Road Map. Abbas - the head of the PLO - is walking a tightrope from which he threatens to topple when the Road Map is finally declared dead and buried. Hamas will certainly not be holding a safety net under it to break his fall. Hamas will be more than prepared to then take centre stage in the West Bank and perform acts that will blow away both Jews and Arabs without compunction. Facing these developments in Gaza and the West Bank, King Abdullah continues performing his own dangerous trapeze act - swinging from rung to rung in a desperate effort to maintain the 88 years old rule of the Hashemite family in Jordan against possible efforts to topple it from power - as the PLO attempted to do in 1970. King Abdullah’s subjects are all Palestinian Arabs - born either in eastern (Transjordan) or western (Cisjordan) Palestine. They far outnumber the Palestinian Arabs residing in the immediately adjacent West Bank. Culturally, socially and religiously there are no discernable differences between them that would justify the need for two adjoining States - rather than just one combined State - in which they could enjoy the right to self determination. Jordan’s 1994 peace treaty with Israel is unlikely to ever be emulated by either the PLO or Hamas whose joint goal is the destruction of Israel as a Jewish State - only differing in the way it is to be achieved. The Hashemites ( who originally came from what is now Saudi Arabia to Palestine in 1920) are entitled to be regarded as - and have earned the right to be - the legitimate source of authority for all the Arabs of former Palestine. 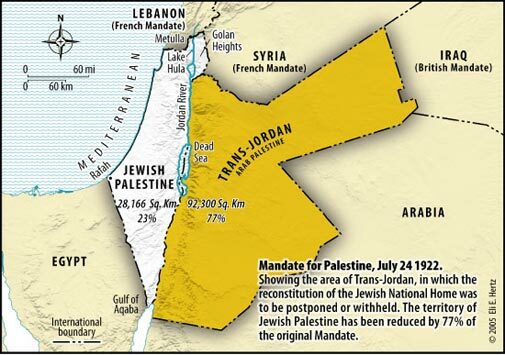 They were responsible for securing all of former Palestine east of the Jordan River as an exclusively Arab State in 1946 to the total exclusion of the Jews to whom it had been promised initially by the League of Nations. Abdullah knows that if Hamas seizes power in the West Bank it will spell serious trouble for the future role of the Hashemites in Jordan. “Liberating” the 77% of former Palestine that King Abdullah presently controls would certainly be high on Hamas’s agenda. Abdullah therefore has no option but to support Abbas in the Road Map negotiating process even though it continues to go nowhere and even though he still remains suspicious of the PLO’s motives after its attempted 1970 coup. When that process inevitably hits a brick wall Abdullah will need to turn to Israel to conserve his family’s rule in Jordan and keep Hamas out of his sphere of influence which still includes the West Bank - ruled by the self same Hashemites from 1948-1967 until it was lost to Israel in the Six Day War. King Abdullah will have to maintain the struggle to free the Arab population of the West Bank from Israeli control. Arab unity will demand Abdullah do so. He will find Israel more than ready to accommodate him by the simple expedient of redrawing the international boundary between Jordan and Israel within the framework of the existing Israel-Jordan peace treaty. More importantly for Abdullah it would see Hamas in control of no part of the West Bank. In the meantime the current circus will continue on its merry way - playing to a large media entourage in a dazzling array of countries and exotic locations. Plenty of fairy floss will be sold for public consumption and many trial balloons floated over the next nine months. One outcome is guaranteed - this is one circus that won’t be getting any rave reviews.